Alice Gosti created Yellow Fish – Epic Durational Performance Festival in 2013 to focus on performances lasting anywhere from one to 48 hours. Inspired by artists such as Marina Abramovic, Doug Aitken, Salt Horse’s 12-hour play and others, Gosti raised enough funds with help from the community to run the festival for a third time this year from July 8-August 5, 2015. She partnered with local institutions Studio Current, New Tomorrow, the Northwest Film Forum, the Hedreen Gallery, KT Niehoff and 10 degrees, and Velocity’s International Seattle Festival of Dance Improvisation, and this year’s line-up included Adam Sekuler, Juan Franco, Pol Rosenthal, Jody Keuhner, A K Mini Allin, Mother Tongue, Runn Shayo, LIMITS, Brace Evans, Paul Budraitis, Keith White, Underscore, Jennifer Monson, Ryan Vinson, MKNZ and HATLO, and Curry + Dillon. New Tomorrow, the intimate space where MKNZ and HATLO performed Days That Stay With Us August 3-4, featured an installation of polaroid pictures capturing MKNZ and HATLO’s former relationship from 08.27.04 to 09.19.09, as well as a scroll of paper mounted on a wall with HATLO’s fresh handwritten words in tattoo ink. MKNZ and HATLO had people participate in the performance by signing up ahead of time to have a date of their choice tattooed by MKNZ. In exchange for their free tattoo, the story accompanying the date was retold and then transcribed by HATLO onto the scroll of paper. Each day from 1:30-8 PM, people came to New Tomorrow and shared their story to the few (if any) observers, and left with the reminder of that memory imprinted on their skin. When I came in at 4 PM on August 4, MKNZ was carefully tattooing a date on an individual using the traditional stick’n’poke style. The date 06.15.07 marked this particular individual; it was the day they were openly discriminated against for being gay. This led them to the Peacemakers Training Institute in Virginia where they learned what oppression and privilege meant, expanding their mind and honing in on their identity. As the story of one person—in six billion—who lived through 06.15.07 unravelled, HATLO audio-recorded the story with her phone, and all three listeners quietly took in the words. Afterwards, HATLO replayed the memoir on her headphones, and wrote down a synopsis of the story with tattoo ink on the long scroll of paper. “06.15.07” joined “8:20,” the time a woman gave birth, and then we waited for the next participant who never arrived. After a few minutes I was offered the opportunity to participate. The nocioreceptors slowly lightened up as a date—02.11.14—was tattooed on my freshly cleaned skin. The vivid reminder of our limited time in this world lives daily in my mind, and now on my skin too. My story was closely followed by “04.11.-,” “07.21.88,” and many more. The scroll kept rolling up as the final dates and their stories were imprinted on flesh and paper. 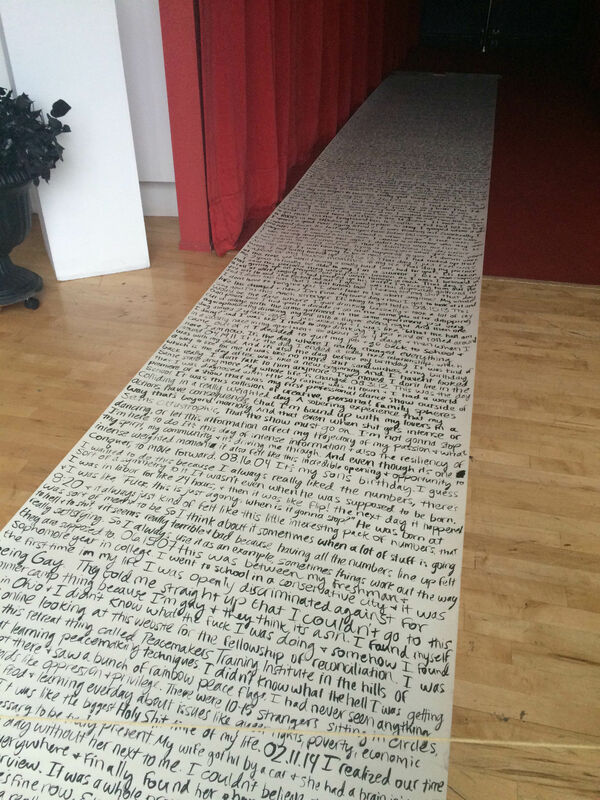 The scroll was then taken to the Hedreen Gallery, where it was laid in the backroom on the floor like a red carpet. 08.27.04 was the first date and story on the scroll, and 09.19.09 was appropriately the last one. As is probably the intention of Yellow Fish as a whole, Days That Stay With Us brought up questions about what performance is, the physicality of performance, and the durational component of it. Does telling one’s story become a performance when we call it a performance? Is it the mindfulness behind having a conversation about someone’s memory a performance? Does a performance need to be physical, and what is the exact length in time of Days That Stay With Us? Is it just the storyteller’s life? Does it begin as a performance on the story’s day? How different is it to have a date tattooed versus holding that date present in one’s mind daily? Stories are shared everyday through photographs, gestures, tattoos on bodies, words heard and read. There are many stories in that scroll, and so many more in the world not represented on the scroll. However, those untold memories are present in the scroll through their implicit connection to universal stories—stories of discrimination, abuse, regret, heartache, poverty, and love. The feeling of a needle on one’s flesh is brutal; the date now visible—and not only in one’s mind—moves with one’s body everywhere, carrying over to the physical world. It doesn’t only last the tattooed person’s life, it can last forever in the minds of those who heard it and told the story to a younger generation. Luckily, the passing down of stories continues, and the Days That Stay With Us not only stay with us, but live forever. More information about the Yellow Fish – Epic Durational Festival can be found on their Facebook page.